Before I begin with my write-up, I wanted to say that I was delighted to have an opportunity to review the Dragon’s Heart picks. I have (literally) jars of picks I’ve accumulated over the past decades of playing guitar, bass, mandolin, (the extremely occasional) banjo, and world instrument. I’m always on a quest to see what new or better sounds I can make with the instruments I have or use. 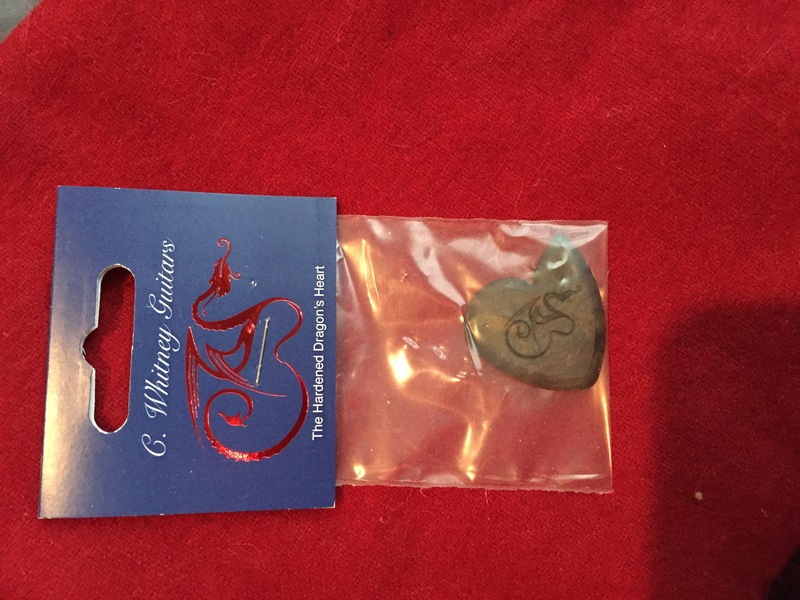 There are different formulas and materials and prices for the varieties of the Dragon’s Heart guitar picks. I’ve been playing the three (current) varieties of the Polyamide-Imide Dragon’s Hearts. This includes the Hardened pick (70% Polyamide-Imide/30% Glass Fiber), the Original (88% Polyamide-Imide/12% Graphite), and the Pure Dragon (100% Polyamide-Imide). 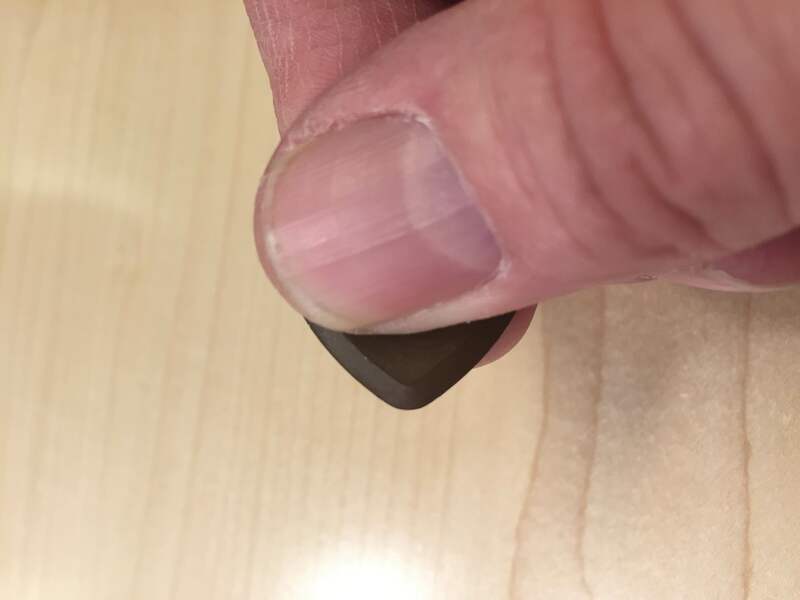 These picks last 3-5 times longer than the standard plastic thick pick, and have largely different sonic characteristics than many other guitar pick materials. It’s easy to say that many pick designs have come and gone over the years. After all, musicians such as me are always trying to find a way to make music in a fresh way. Many designs become staples (such as the plastic classic 351-shape teardrop pick) and others become used as useful and interesting novelties (such as custom-ground metal coins). My experience is that even more (probably most) actually fall somewhere in between. Each and every pick material, design, and use has its legions of fans and detractors. Let me begin my review summary by saying two VERY important things. Picks have a HUGE effect on the sound of an instrument (for those who use picks 🙂 ). EVERY musician is as individual as their fingerprints – and therefore their tastes and abilities vary almost wildly. We are all different: Vive la différence! The Dragon’s Heart Picks are versatile, well-made, and sonically extremely interesting. Given that Dragon’s Hearts are fairly thick and rigid, they are different in their sound, playability, and player-experience feel from standard plastic 351 Fenders or even thick Steve Clayton three-sided Delrin picks. Dragon’s Hearts have a rigid, extremely precise feel. They have a well-defined attack (varying slightly depending on which pick edge you use – see below). They are easy to grip and comfortable in the fingers both when they are new and after they have been used for a while. This review is written with an open-minded approach to picks: I don’t advocate anyone to play a particular size, material, shape, or type – rather, I look at picks as a VERY inexpensive way to help one’s playing style grow. It’s easier and simpler than almost any other technique to change one’s tone. And besides, it’s just plain fun to find new territory with a simple pick change. The short summary of this review is this: if you want more control, more sound, better attack, and durability, you just can’t go wrong with Dragon’s Heart Picks. They’re fantastic! No matter your picked instrument, give all the Dragon’s Heart varieties a try. You’ll keep them around for a very long time. 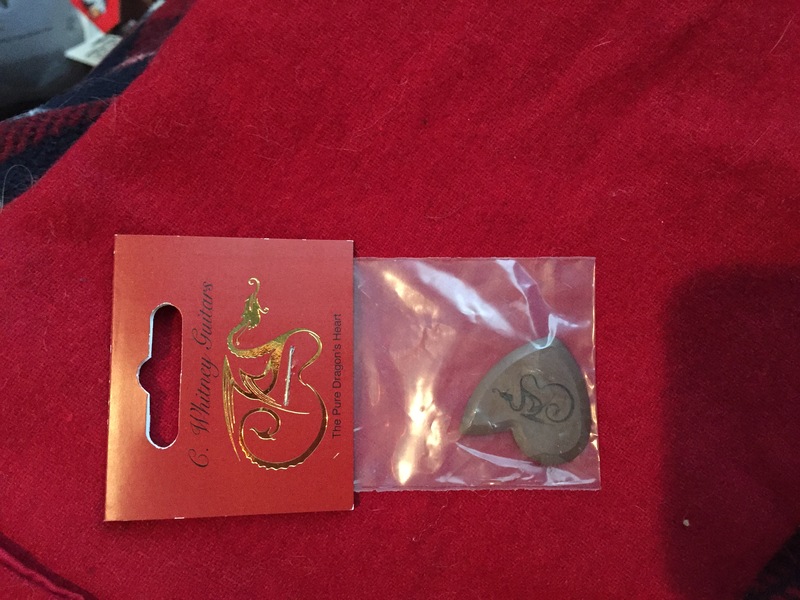 You can hold your Dragon’s Heart pick in three different ways (plus a bonus fun fourth way!) to get three different sounds and playing styles. One main “point” is a sharp, almost talon-like picking edge and surface (see what I did there? ;-)). Another point is rounded and almost circular in shape, and the third is reminiscent of the old-fashioned 351 teardrop tip. 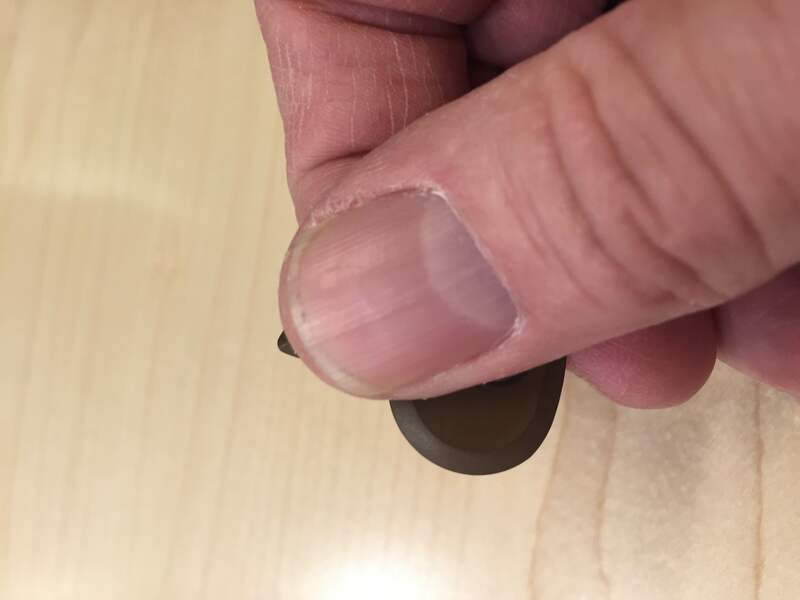 If you hold the pick just right, you can also get a combined round-tip and sharp-tip to get a two-point picking attack that’s quite a bonus – it has a very unique feel and sound. The sharp point gives a clear and concise attack with an incredibly quick release. It requires a deft touch to go fast and a gentle hand to go slow. This edge is excellent for high-speed shreds or really high-treble jazzy rolling fast arpeggios. The “normal” style point is just as you’d expect. You get the kinds of attacks and string releases you’d expect from a beveled-edge teardrop-shaped thick pick. Very nice… intermediate between warm and clean. The rounded point gives you that warmer approach with a very slow release and a moderately slow attack. It’s also useful for “swiping pick attacks” where the hand not only plucks the string with the pick but the pick is slid or swiped down the surface of the string a bit. One can truly get a sweet, warm, swishy attack and a lovely rounded-off back end of the release with this surface. Overall, VERY nice… EXTREMELY flexible and easy to use for a variety of styles and sounds in one given playing session – all with one pick. 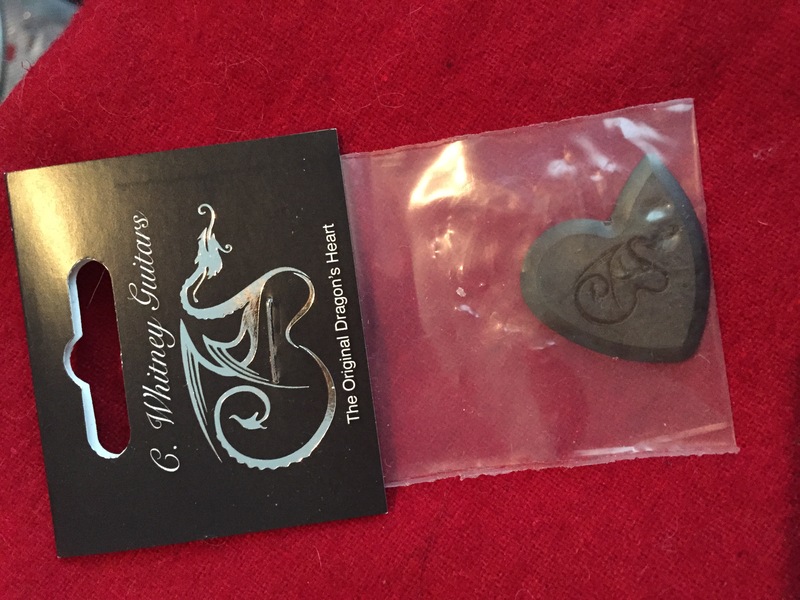 C. Whitney Guitars’ Dragon’s Heart picks are easily some of the most comfortable thick-ish picks I’ve played in my 42 years of stringed-instrument playing. I have long, medium-diameter fingers with moderately high hand strength. I don’t sweat in my hands much – although I’ve been known to have dry hands at times. For me, I don’t want to know that the pick is in my fingers. I just want it to be an extension of my mind: from mind to hand to pick to string. Overall, when I pick up a Dragon’s Heart, it just works. It just fits. It just feels fine. And that’s a good thing. The Polyamide-Imide picks don’t get slippery or require me to give them the death’s-grip hold in order to keep them set at the right angle when I’m playing wrapped or even plain/wire strings. This is EXTREMELY important to me because I have arthritis and joint pain: I need my grip to be the LAST thing about which I must think when playing an instrument with a pick. 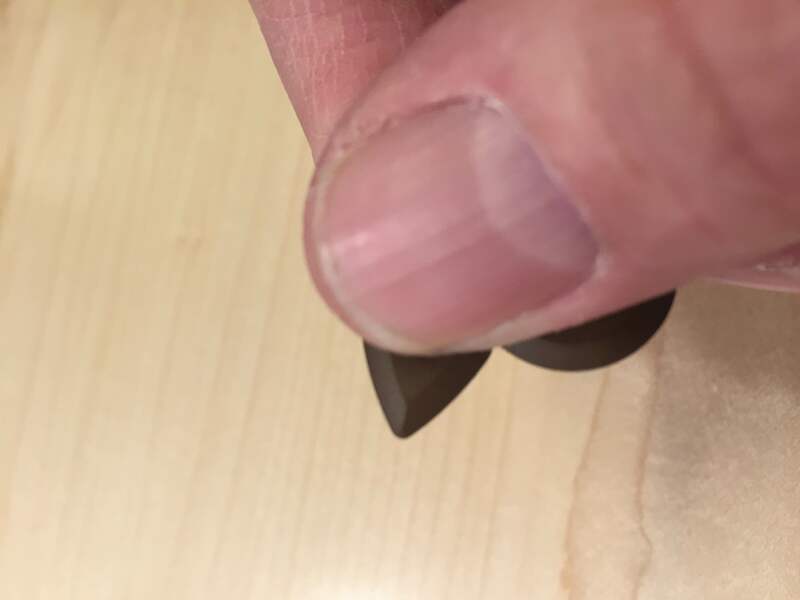 When it comes to durability, the edge and angle of the edge of the picks stays consistent for a long time. I’ve not played any my three Polyamide-Imide picks for more than 1000 hours – with that said, they have held up as well or better than some of the thick “clear plastic hard” picks I use a good bit (including my gel Jim Dunlop >1mm picks). 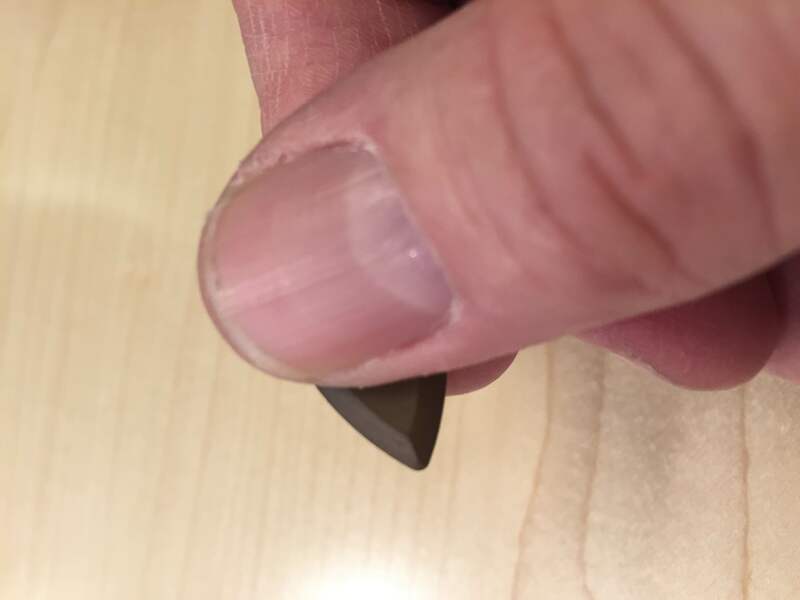 The critical durability of the edge of the pick… It’s important to note that I am not a hard picker. I don’t bang the strings (I caress them, or at most pluck them). With that said, when I’m playing rock music I do the rare-but-inevitable pinch harmonics from time to time. I do play a HUGE variety of instruments and string materials (flatwound, half-flat, round-wound, coated, uncoated…), so I’ve run my Dragon’s Hearts through the ringer quite a bit. Now that I’ve played them quite a bit, I can say that I’m not getting the dulled edges and he numerous I have seen with other alternative-material picks by this point. I still get wear and little marks here and there, but I can assure you that they don’t cause any sound difference or playability difference for me. I suspect I’ll get the manufacturer’s approximate durability hours on my original three Dragon’s Hearts. The Polyamide-Imide Dragon’s Heart picks are a premium-price-point pick for most players. These don’t cost a quarter dollar each at your local store. That’s OK. they’re worth MUCH more. I’ve paid between $.10 for a pick and I’ve paid $12 for a pick, so I’m willing to try new stuff. These are WELL worth the money. The price is appropriate for a durable, long-view, ultra-versatile pick. Even guitarists on a budget will find the Polyamide-Imide Dragon’s Hearts to be a bargain in the long run. As one’s playing style is enhanced by the pick’s uses, and the durability of the pick is realized, the price is actually well worth the extra money. Quality-wise, all three of my Dragon’s Hearts felt great on all the surfaces, were well-made, and had no crazy rough parts to them in their factory bags. As I played them, the overall consistency of feel and durability between the three current Polaymide-Imide picks was very similar. There isn’t much in my Jim’s Wish List for these, honestly. They’re as I’ve described and I probably wouldn’t change a thing, other than maybe a version with a dragon cutout in the center for those who need a little extra grip for sweaty or oily hands. Otherwise? Great! This entry was posted in Accessories Review and tagged acoustic, bass, dragon's heart picks, electric, guitar, mandolin, picks by Jim of Vivid Peace. Bookmark the permalink.